Get you a fighter who can do... almost everything. In Madrid and New York this weekend the Capcom Pro Tour continued, post-EVO, in a relatively low-key way. The gigantic screens of Mandalay Bay’s mainstage, 13,000 screaming fans and ESPN were replaced by two small monitors on a humble setup. EVO may well be over, but the Pro Tour regional ranking events are always happening. For the players, the grind never ends: points must be earned! As well as the glitz and glamour surrounding the event this year, EVO was also notable among players and viewers as the event where the ‘tier list’—a totally opinion-led order of which characters are the strongest and most effective in tournament play—began to take shape. The top 8 consisted of several Nashes (one being the overall winner) and a few Chun-Lis, rounded out by a Vega, a Ken and an R. Mika. No Dhalsim. No Zangief. No F.A.N.G. Six months into Street Fighter V’s lifespan and there’s no denying it is a very finely balanced game, but it’s clear that top players are starting to figure out exactly what works. In the two tournaments that took place this past weekend, a Chun-Li player came out on top. EVO top 8 competitor M.O.V. (which he informed us in his post-tournament interview stood for Master Of Vampires, which is obviously brilliant) travelled from his home in Japan to win Sonic Boom in Madrid while Street Fighter mainstay and Evil Geniuses team member Ricki Ortiz won Defend The North. Both had dominating performances with the character, but why exactly is Chun-Li shaking out to be the best of an excellent bunch? Breaking her down to her basic button presses, she has incredible ‘footsies’, the ability to poke at her opponent and counter their attempts at doing the same back at her with rangey, quick strikes. A great player will find the perfect range to throw out one of these strikes to connect with the other player and keep them under pressure at all times. Hell, her crouching fierce punch even slides forwards under fireballs and can be used to confirm into a devastating combo. Her standing fierce punch has freakish, almost Dhalsim-esque range and was used effectively by Ricki Ortiz in the grand final of Defend The North against Team Liquid’s NuckleDu, constantly peppering him with damaging shots and not giving him space to breathe and think about his next move. Now it’s time to talk a bit about frames. No, wait, come back! I know they’re a bit tedious, but they’re a massive part of the high-end of Street Fighter and are a bit easier to understand with Street Fighter V. No move comes out quicker than three frames in SFV. Three frames of startup is exactly what it sounds like: three frames of animation where the move is classed as beginning and will not hit the opponent and you yourself can be counter hit out of it. Chun-Li has two grounded moves, her crouching light punch and kick, that are three frames. These can be confirmed on hit into combos, making them extremely useful tools for catching aggressive players—she will beat them, most of the time. Now, remember what I just said about no move being quicker than three frames in Street Fighter V? Good, well, Chun-Li’s aforementioned standing fierce punch, with it’s brilliant range and speed, puts her at a disadvantage of -3 frames when it is blocked by an opponent. Put simply, that means they have a three frame window to counter-attack her freely if they defend against that attack. 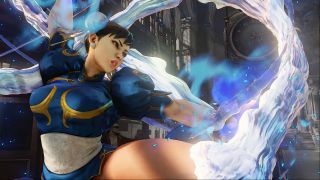 Not everyone in the game has a three frame move, however, and even better for her, fewer still can get that strike to connect in the range that Chun-Li engages from. She has a ‘get off me’ move in her EX Spinning Bird Kick, which will immediately rid her of any overly aggressive opponent if done while getting up from an attack. Like most reversals, it is invincible during its animation. Again, only a few characters have an invincible reversal. Admittedly, Chun’s does need her to use a block of her Critical Art gauge, but that’s not such a big deal when you see how characters without an invincible reversal have to defend themselves from serious pressure. What else does she have? A fireball? Check. An air throw? Check. Overhead? Check. Hell, the only thing she doesn’t have is a command grab. She’s one of the most ‘complete’ characters in the game. To tie this all together, she arguably has the highest level of execution needed to make this work. She has something that the FGC has decided to call ‘Instant-Air Legs’, which although sounding like a terrible injury, is actually the ability to do her mid-air version of Hyakuretsukyaku the second she leaves the ground, hitting a standing opponent rather than a jumping one. It’s a key way of maintaining pressure but requires considerable skill to pull off consistently. She also has a couple of combos that, if you’re going for optimum damage, end with Spinning Bird Kick but have only just the amount of time needed to charge that move during the combo, so in order to pull them off you need frame-perfect timing. Again, with SFV’s slightly more relaxed link window during combos, this sort of precision is not the norm. Simply put, players who win tournaments, players at the highest level of Street Fighter V are going to be able to perform this stuff and her high execution ceiling is going to be less of an issue to them, as opposed to us regular folk struggling out there in the Ultra Silver ranks. They’re now seeing that if you can pull this stuff off, Chun-Li is one of the most well-rounded and versatile characters in Street Fighter V. Obviously, the tier list is always going to be one person’s opinion against another, but before this weekend, the argument was that Chun wasn’t the best character in the game because no player had won a Major with her. She’s now claimed two in the space of 24 hours.